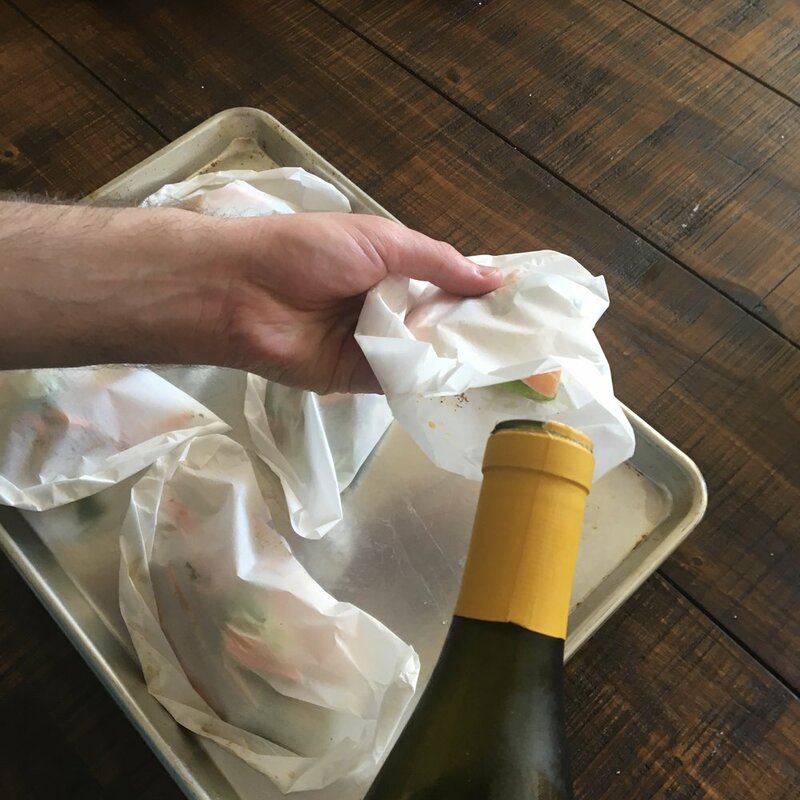 Fish en papillote or "fish steamed in a packet" is the perfect healthy weeknight-dinner-in-a-flash or prepare-ahead-presentation to amaze your fancy friends dish. I also love it because, like most of my techniques and formulas, it is versatile and can be completed with various types of fish and whatever vegetables, citrus and seasonings I have on hand or feel like using. It works in all seasons - just vary the contents. Spices and fats are optional. So versatile, in fact, everyone in the family can make a personalized version suited to his or her exact tastes and preferences. Last but definitely not least, it conveniently uses up that opened bottle of white wine hanging out in the fridge that no one is ever going to drink. The amounts listed are for 1 serving or 1 papillote pouch. You can easily multiply to provide as many servings as you need, plus an extra for tomorrow's lunch. This provides a meal unto itself, but also pairs well with additional roasted, steamed or sautéed vegetables, roasted potatoes or steamed rice. 1-2 tablespoons liquid. I prefer a dry white wine, but beer, broth and even water do the trick. 1/4 cup finely sliced or diced vegetables. Use what you have on hand. Carrot, zucchini, bell pepper, cabbage, jalapeño, brussel sprout, and sweet potato are all great. parchment paper cut into large "hearts"
*Note on fish selection: Where you live will determine the best fish choices for you, for freshness and sustainability. Check out this resource by Oceana and Monterey Bay Aquarium's Seafood Watch for a guide on selecting fish. You can choose printable pocket guides that are specific to your region or download their nifty phone app. 1. Preheat your oven to 400 degrees and prepare all of your papillote fillings. 2. Set up your station with prepared parchment paper, salt, oil and fillings. 3. Season each piece of fish with salt. Add spices and a touch of oil or butter if desired. 4. Place a slice of citrus on each piece of parchment. Lay the fish fillet on top. 5. Top the fish with your selected vegetables. 6. Season vegetables with a few pinches of salt. 7. Seal the parchment (see video above) leaving a small opening at one end. 8. Hold the filled pouch gently in one hand as you pour about 1 - 2 tablespoons of liquid inside. 9. Quickly seal up the open end by folding it a few more times. 10. 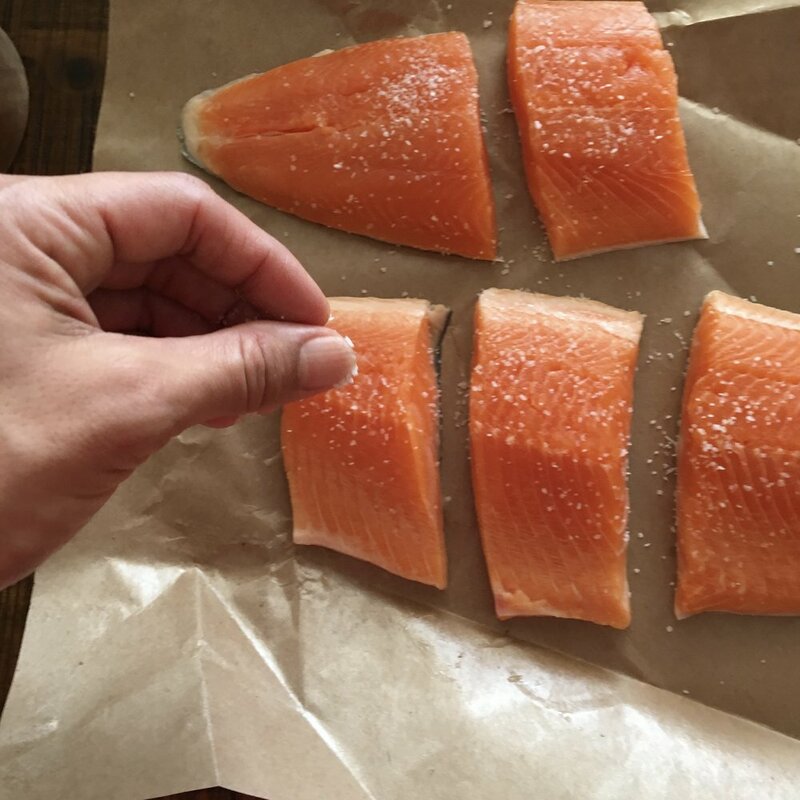 Arrange papillotes in a single layer on a baking sheet and bake for approximately 15 minutes, more or less for larger/denser or smaller/lighter pieces of fish. Note that fish cooked en papillote will cook faster than if you are roasting fish outside of parchment. The steam trapped inside the papillotte is hotter than your oven and will cook fish faster.